On its first day of availability on the App Store since it was – surprisingly, to many – approved by Apple, Opera Mini for iPhone (iTunes link) was downloaded one million times. 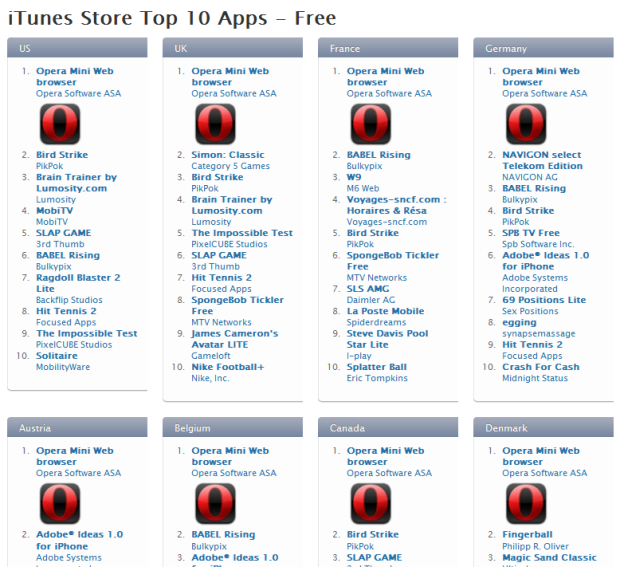 Opera this morning announced the milestone, and added that Opera Mini is currently the number one iPhone app in the 22 featured Apple App Stores on their site, as of 8 AM CET on Thursday. Update: app store analytics company Distimo posted more stats. Granted, there has been a ton of coverage for the occasion of Apple letting a competing mobile browser product from a major software company into the App Store, and reviews have been getting published all around the world ever since, but it’s still a noteworthy achievement. According to Apple’s download count, Opera Mini has to date been added to 1,023,380 Apple devices. If you’ve downloaded the app and tested it, we’d love for you to tell us if you’re going to keep using it, and what your general thoughts are. Be sure to reach MobileCrunch’s hands-on review of the app – it goes into great detail. For your reference: the widely anticipated Skype iPhone app was downloaded 1 million times on the first two days of availability in the App Store, and it took PayPal close to three weeks to reach one million installs despite its 81 million-strong user base.